Today’s been interesting and sort of productive. I feel like writing a ‘bloggy’ sort of post so this is what today’s OneADay will be. Phoned what feels like 101 different call centres to solve a relatively simple problem. Really it was only four but at least two of them felt like a total waste of time that could have been easily bypassed if someone had done their job properly. I was friendly throughout though. I’ve worked in a call centre. Even if someone’s obnoxious to me, I feel bizarrely obliged to be polite and friendly, simply because I sympathise with them for working there. I emailed someone regarding some freelance work. I got an email back at least. Just depends on what their freelance budget will be like for the next quarter and presumably whether they actually want me too! Fingers very tightly crossed. 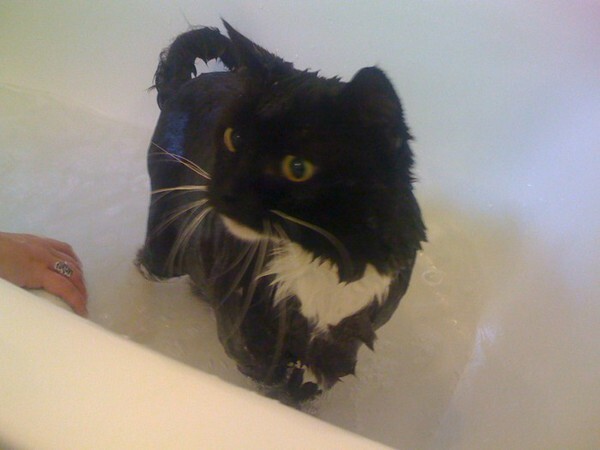 I gave the cat a bath. Yes indeed. He’s been struggling against far too many fleas for a while now. No other method has worked well and me and my Mum remembered that a bath worked well a couple of years ago. He only had the bath that time because he got into a fight with a grass snake and ended up stinking, but as a side effect it kept him flea free for a bit. Luckily he’s quite a trusting cat. A cat that never claws or bites out of malice, so we weren’t expecting him to go ballistic. And to be fair he didn’t, as far as cats go. He did however panic as I lifted him into the bath, thus clawing my arm quite fiercely. It bled for a while and it’s still looking a bit nasty. Even better, I haven’t had a tetanus jab in over 10 years so off I go tomorrow morning for another one. Hurrah. I hate needles. Better safe than sorry though I guess. And of course now I’m writing this. I’m off to work in less than an hour so I figured it was a wise idea to write this now rather than when I return tonight knackered. My Uncle put his in the tumble dryer a month back (accidentally), your method is much more conventional mind! Hope it works against the fleas.